Because I'm feeling particularly ugly and bruised following the dog bite, I'll be sitting out 4th of July activities. Have some fun for me, will you?! Clean all the fruit, and let the kids assemble your ingredients in a pattern that they like (or you decide on). Serve chilled. OK...that was WAY too easy. So, I'm going to share the link for my sangria recipes too. Definite party pleasers! Click HERE! Your Fruit Kabobs would be really good with my Brisket. Hope you have a great holiday and thanks for hosting! Yummm!! Love me some fruit kabobs! Thanks for hosting! I shared my Sweet & Spicy BBQ Sauce at #31, just in time for the 4th! 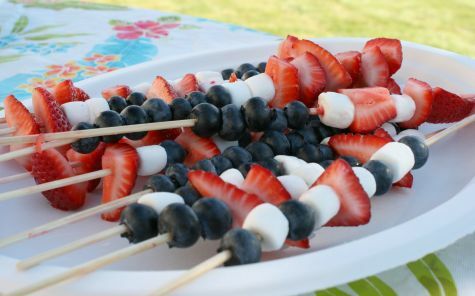 I'll have to incorporate those fruit kabobs into our menu!